When it comes to graphic cards, its probably the fastest evolving industry. Graphic cards have a life cycle of just 3-4 months these days. And of course its mostly because of the war of the leaders AMD (ATI) and Nvidia. AMD released the Radeon HD 6990 what it calls the worlds fastest GPU. The industry is now focusing into some thing called single-slot dual GPUs where in 2 graphic cores are embedded on the same single GPU. 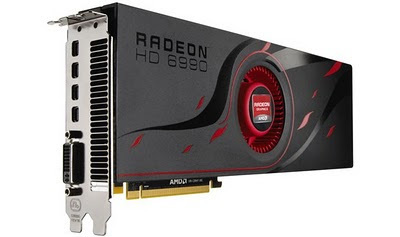 The Radeon HD 6990 is a combination of two Cayman HD 6970 GPUs.The official release states that the card achieved a world record score of P11865 in the industry standard 3DMark11 benchmark which has beaten NVIDIA's record 3DMark 11 score. The card has a whopping 4GB of DDR5 memory, Its has 2 graphic cores running at 830Mhz, Memory Clock 1250MHz (5.0 Gbps GDDR5). The card can support up to five displays using AMD Eyefinity multi-display technology. The intresting thing about this card is that it has a dual-BIOS toggle switch, allowing to unlock the card and rev up the clocks and voltages for even more performance which make it a lot simple to over clock. The card obviously supports AMD CrossFireX multi-GPU technology allowing for muti GPU configuration. I wonder the kind of monster a machine would turn into if you throw in two or four of these Radeon HD 6990 GPUs. Although this card is the fastest single slot dual graphic card it cost way too much its priced at launch for $699. The same performance or even better performance can be achieved by running 2 Cayman HD 6970 in crossfire which costs half the price. But of course you get the advantage of energy efficiency which has become another noted and compared benchmark for the industry. The card is also said to be the nosiest card in the industry by popular hardware reviewers with noise level exceeding 70 decibels. Ultimately this card is and engineering master piece which crams up so much in so less of a space. All that said the industries eyes are now fixed on Nvidia's launch of the its single-slot dual GPU card offering dubbed to be named as the GTX 595 or 590.